In attempting to trace the history of hasta mudras, I must first discuss the context in which these hand symbols became codified. This is the ancient dance that was originally practiced in Hindu temples as a pan Indian art form. As a practitioner of a dance tradition that has been disseminated orally for thousands of years, pinpointing its exact origin and history seems almost irrelevant. Most gurus, when asked, emphatically say that Lord Shiva alone is the ultimate source for this ancient art. There is a sense of timelessness in their tone that reveals a tradition that is steeped in deep faith, surrender, reverence, and acceptance. Therefore, the question of origin seems to fall outside this perspective for most traditional teachers. As a result of this surrender to the oral tradition and to one's lineage, there has been limited physical historical evidence that we can rely on today. Documentation of choreography, technique, and artistic practices has not been a priority for practitioners until very recently. Clues from written texts, archeological findings, temple sculptures, paintings, and inscriptions have been pieced together to create a reasonable history. However, more than any other evidence, a written text, the Natya Shastra, holds invaluable information about the form, function, and technical details of dance and theater in ancient India thereby introducing us to the codification of hasta mudras. Recent example of dance notation developed by Acharya Parvati Kumar to preserve choreography in Bharata Natyam dance technique. Sanskrit shloka verses illustrating usage of hasta mudras excerpted from Bharatas Natya Shastra Vol.I published by Manisha Granthalaya, Calcutta, 1967. For our purposes here, I will refer to respected dance scholar, Kapila Vatsyayan's interpretation of the Natya Shastra. Through an analysis of its writing style, language, grammar, references to names, and various other elements, Vatsyayan historically places this treatise between the 2nd century B.C. and 2nd century A.D. Its authorship, attributed to an individual named Bharata, and even the amount of time taken to write this voluminous treatise are both questionable. What is certain is that the author was equally familiar, not only with a variety of arts, but also Ayurvedic medicine, philosophy, cultural and religious practices, and even mathematics. Thus, the Natya Shastra becomes a confluence of all these disciplines in the context of performing arts that included elements of theater, dance, and music. What is also clear is that the foundations of artistic theory and practice laid down in the Natya Shastra were adhered to quite rigorously by theoreticians and practicing artists for about two thousand years up until the nineteenth century. Sanskrit shloka verses illustrating usage of hasta mudras excerpted from Nandikesvaras Abhinaya Darpana published by Manisha Granthalaya, Calcutta, 1981.  To follow Vatsyayan's research again, Bharata writes in the language of Prakrit (a close linguistic relative of Sanskrit) in simple verse form, including some prose. The 36 chapters detail all aspects of the performing arts including exhaustive elements of artistic experience (from the point of view of the creator), artistic content or states of being, and structure of the dramatic plot. Hasta Mudras, which is my focus here, are included in the artistic content. The hasta mudras form an integral part of angika abhinaya or stylized body language, in which the goal is to create an image in the mind of the observer. There exist several other texts on the topic of dramatic performance and dance movements. One of the most important of these, with reference to hasta mudras, is Nandikesvara's Abhinaya Darpana (literally, Mirror of Gestures) written around 1000 AD. This compact text can be described as an abridged dancer's guide based on the Natya Shastra. What Nandikesvara did was to extract only the chapters specific to Indian dramatic technique and its essentials. The hasta mudras, an essential component of this technique, will be my focus hereafter.